Foreglen will meet Steelstown next Sunday for a place in the Small & Hyland Derry Intermdiate Championship final after holding off a late charge from Craigbane at an emotional Owenbeg on Sunday. The O’Brien’s were playing their first game since the sudden passing of their long serving goalie, Gary McGee, and as a mark of respect the team warmed up in training tops with the No. 1 on the back. For Craigbane, it was a case of trying to get 15 fit footballers out after injuries, retirements and emigration cut deeply into their playing personnel. It meant a surprise return for one of their best ever players, Fergal Crossan, who came out of retirement and was having quite a game until he pulled up with an ankle injury midway through the second half. Foreglen know this kind of performance will not win the championship, it was a traumatic occasion which may have accounted for spells in the game when they seemed to lose their focus. With reserve goalie Ronan Tracey in Canada, the Foreglen management plumped fro the tall Niall McConway, a reserve outfield player, and they struck gold. His confidence under the high ball, allied to a brilliant double save and a thumping kick looks like they have a top quality goalie for many years to come. Craigbane did what few other teams have done in Intermediate football. They more than broke even at midfield against the big McCormick brothers, Mark and Gavin and had they got more primary possession to Lee Moore they could have snatched at least a draw. Foreglen are used to Oisin Duffy driving forward but he had his hands full with keeping tabs on Moore. As usual it was the unerring accuracy of Kevin O’Connor that accounted for important scores. He hit eight points with six coming from frees but his all-round play caused huge problems for Craigbane. Lee Moore and Jude McLaughlin contributed handsomely to their total but there was not enough support else where. Foreglen made a hesitant start and were three points down but gradually their superior pace told as they reeled off seven points in a row for 0-7 to 0-3. It looked like going to script until Criagbane rallied with Kevin Dunne, Jude McLaughlin and Crossan leaving it only 0-7 to 0-6 at half-time. Foreglen made two second half changes with James O’Kane and Ciaran McFeely entering the fray but it was a short stay for McFeely who was red carded two minutes later. From the resultant free Jude McLaughlin levelled before Moore edged the Lily Whites in front. A Kevin O’Connor free brought Foreglen level and it was keeper McConway who then came to their rescue with a brilliant double save as Craigbane pressed. Foreglen began to get moving smoothly again and a braced of Kevin O’Connor frees had them 0-10 to 0-8 in front by the 46th minute. Eleven minutes from the end, Brian Rainey picked out Ryan Moore with clever pass and his finish was perfect to bring it back to a one point game again. Foreglen then put in a scoring burst that won the game. O’Connor from a placed ball and open play put his team three in front and when Gavin McCormick split the posts, the 0-13 to 0-9 lead looked secure with seven minutes remaining. However a brace of Jude McLaughlin points brought Craigbane back in the game. Thomas Reilly then misjudged the bounce with a goal beckoning before a move started by corner-back Eoin Coll ended with Moore cutting the margin back to one point in the 60th minute. Foreglen broke to make it a two point game but Craigbane kept coming and in the 63rd minute a Moore free proved to be the last score of a very good game. 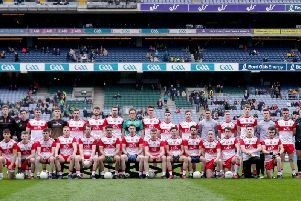 Foreglen: Niall McConway, Ruairi Duffy, Cahal O’Hara, Conrad Sheerin, Adrian Armstrong, Oisin Duffy, Sean O’Connor, Gavin McCormick (0-1), Mark McCormick (0-1), Marty Farrell (0-1), Caolan O’Connor (0-1), Liam O’Hara (0-1), Eunan McFeely, Kevin O’Connor (0-8, 6f), Kevin Dunne (0-1).